One of the least visited and most pristine wilderness areas in North America, Big Bend National Park encompasses three very different environments: the Chihuahuan Desert, Chisos Mountains, and snaking Rio Grande river canyons. Dig deeply on this adventure into the region’s cultural and natural history with your naturalist guide, hiking sandy washes, dramatic limestone formations, walking cottonwood-lined riverbanks, hiking mountain trails, watching for painted buntings and vermillion flycatchers, and listening for the distant howl of coyotes. Come with us to explore this off-the-beaten-path treasure of the U.S. National Park system. Island mountains: Birds flock to the forested Chisos Mountains, the southernmost mountains in the U.S.
Desert nature: The Chihuahuan Desert is strikingly diverse. You might see black bears, javelina, roadrunners, collared lizards, golden eagles, and more. Buffalo Soldiers: Visit the restored cavalry post where the African-American “Buffalo Soldiers” were stationed after the Civil War. Seasonal Highlights: Spring brings a flow of neotropical migrant birds, and wildflowers bloom in the fall after the monsoons have passed. Outdoors for 6 to 8 hours each day in warm to hot temperatures and an arid climate. Short hikes over uneven terrain totaling 2-6 miles on most days. 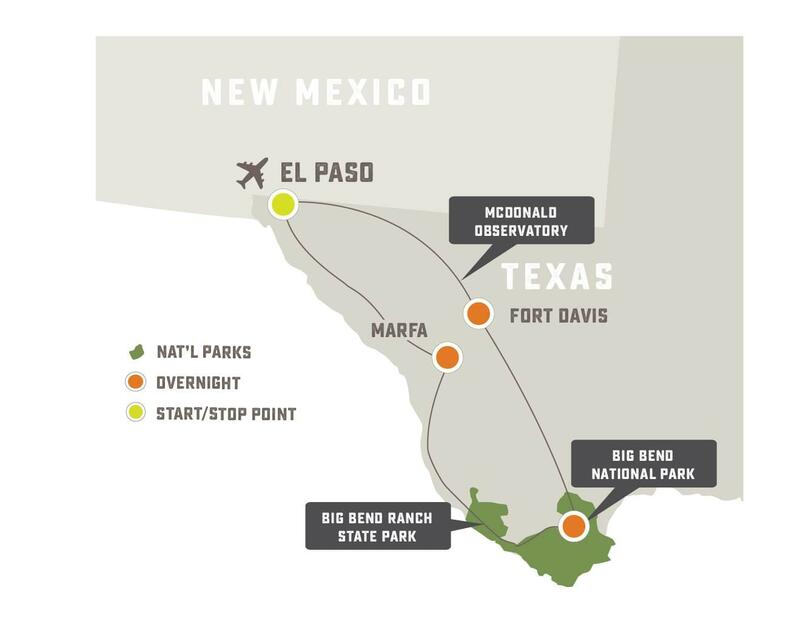 Get to know your guide and traveling companions on the 200-mile drive from El Paso to the little town of Fort Davis, through the wide-open ranching country of West Texas. In Fort Davis, we’ll visit the McDonald Observatory before our welcome dinner and orientation. This morning we visit the Fort Davis National Historic Site, a restored cavalry post where African-American soldiers were stationed. Named “Buffalo Soldiers” by the Cheyenne and Comanche Indians, the soldiers played a critical role in western history, and constituted nearly 20 percent of all cavalry forces on the American Frontier. This afternoon, we travel through Persimmon Gap into the hauntingly beautiful Big Bend National Park, with its rugged mountains, deep river canyons, and stretching desert vista. It’s hard to find a quieter place on the planet. We'll stop at the Panther Junction Visitor Center for an overview, then settle into our accommodations in the heart of the park. We venture out to Big Bend’s legendary Rio Grande Village area this morning to walk amid the huge cottonwood trees lining the river corridor. The group has a chance to meet with park staff to talk about the issues facing Big Bend National Park. A nice picnic lunch and little siesta in a shaded campground refreshes your senses for a visit to the dramatic limestone cliffs of Boquillas Canyon. Enjoy a leisurely breakfast before this morning's hike in the Chisos Basin. The Chisos Mountains are an “island” mountain range, rising above the landscape. Extensive shrubs at these higher elevations shelter Sierra del Carmen white-tailed deer, as well as mountain lions and bobcats. Watch for other wildlife uniquely adapted to the region, including mule deer, coyotes, javelina, Big Bend geckos, and Texas horned lizards. Tonight stroll out into the desert to star gaze and listen for coyotes and common poorwills. A variety of experiences await today, beginning with a hike along the massive walls of Santa Elena Canyon, a magnificent limestone gorge carved by the Rio Grande. The afternoon features a "guide's choice" hike, possibly to Cattail Falls, where ferns grow from rocks near a small pool. For a special treat this evening, dinner is at the Starlight Theatre, a lively restaurant and bar at the edge of the park. Enjoy the subtle evening desert colors or first stars on the way back to the hotel. A final early morning hike in the Chisos Basin sets the panoramic views of the Chihuahuan Desert into your memory. Bidding adios to Big Bend, we make the 2.5-hour drive to our historic hotel in Marfa. Tonight, celebrate the trip with a festive farewell dinner. After breakfast at the hotel, depart for the El Paso airport for early afternoon flights home. 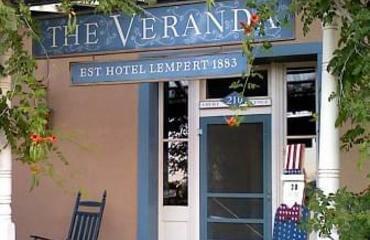 The Veranda Historic Inn occupies a building that has operated as an accommodation since 1883, when it opened as the Lempert Hotel. One block off of Fort Davis’s main street, near Sleeping Lion Mountain, and under some of the clearest skies in the country, the expansive front veranda has a collection of rocking chairs, inviting you to relax and take in the view, both day and night. There are eleven guest rooms in the inn building, as well as a Carriage House and Garden Cottage. Each room is uniquely decorated and has a private bath. Each morning, you’ll be treated to a tasty full breakfast. 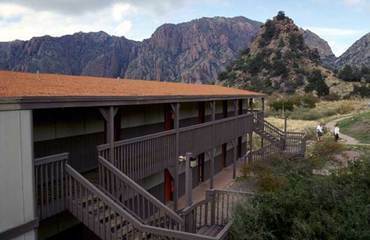 Chisos Mountains Lodge sits within the quiet, remote desert country of Big Bend National Park. Chisos’ seventy lodge rooms include cottages, motel-style, and lodge rooms, all comfortable with no frills—but who needs frills when you are surrounded with such natural beauty? All rooms have a private bath, microwave, refrigerator, coffee maker, hair dryer, and air conditioning or a ceiling fan. There are no televisions or telephones, though televisions may be rented. Cell service is very limited, and WiFi is available in the lobby and outside on the patio. The Chisos Mountains Lodge Restaurant, which is open for breakfast, lunch, and dinner, and which also dishes up the best view “in the state of Texas!” There is a small convenience store and gift shop on the premises. You may very well see wildlife out the door—keep your eye out for deer, eagles, javelinas, and roadrunners. 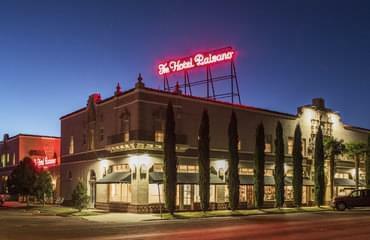 This charming and historic “Texas cattleman’s elegant” hotel originally opened in 1930. It served as the headquarters for James Dean, Elizabeth Taylor, and Rock Hudson in 1955, during the filming of Giant, directed by George Stevens.